I wanted to start my journal entry with a little introduction. I was born in Yonkers, New York and raised about twenty minutes away. I attended Fordham Preparatory School, a Jesuit school in New York City, and continued with my Jesuit education at Fairfield University. I am an avid cinema enthusiast, my favorite director being Wes Anderson, and love the game of basketball. My interest in politics stems from childhood visits to the nation’s capital and famous American Revolution sights like Yorktown and Colonial Williamsburg. It is my hope that I can someday work in the federal government in the capacity of a Congressional or White House Staffer. My typical day at Senator Schumer’s office starts with my arrival at 9:00 AM. At this time I log-in on my desk phone and begin listening to the constituents. As an intern, I am delegated the task of screening phone calls. Constituents certainly have the right to talk with someone with a specific expertise, but not if they are going to yell and scream. Interns are also expected to transfer calls throughout the office and take the messages of constituents that they want to pass along to the Senator. We receive a number of calls from people who are not constituents and are instructed to hear them out, but not record their message. Throughout the day I log the messages of constituents and add them to a list that will be given to the Senator. At 10:00 AM, 2:00 PM, and 5:00 PM the office receives mail. The Senator is constantly receiving packages, junk mail, and constituent letters. Every conceivable magazine publication sends the Senator their publications in the hopes of persuading his votes in the Senate and work in the Democratic leadership. We sort all desired materials into the mailboxes of the staffers that are assigned to those issues. The constituent mail is read, and then sorted into file folders of themes (Environment, Energy, Defense, Israel, Health Care, Medicare, Medicaid, Tax, LGBT Issues, Pro-Choice, Anti-Abortion, Labor Transportation, etc.). These folders will later be divided into subsections, then have each sub-section’s names and addresses recorded into a spreadsheet, and eventually have a form letter crafted to answer the major theme of the constituent’s concerns. For example, some of the Environment folder will be spilt into pro-fracking and anti-fracking. Eventually those who sent letters to the office will be compiled into a spreadsheet, their letters shredded, and a response will be written to answer their concerns with how the Senator plans to deal with the issue. We also deal with letters from people that need help with a specific problem. Most recently those letters are still flowing in about issues with FEMA in regards to Hurricane Sandy. All casework letters are forwarded to our office in New York City. From time to time we receive letters from children, photo requests, and scheduling requests which are all given to the Senator’s personal assistant. Those are the only two things that I will definitely do throughout the course of the day. If given the opportunity, I will seek out a staffer and engage them in a conversation. I like to find out what it is that they do and how they came into their position. 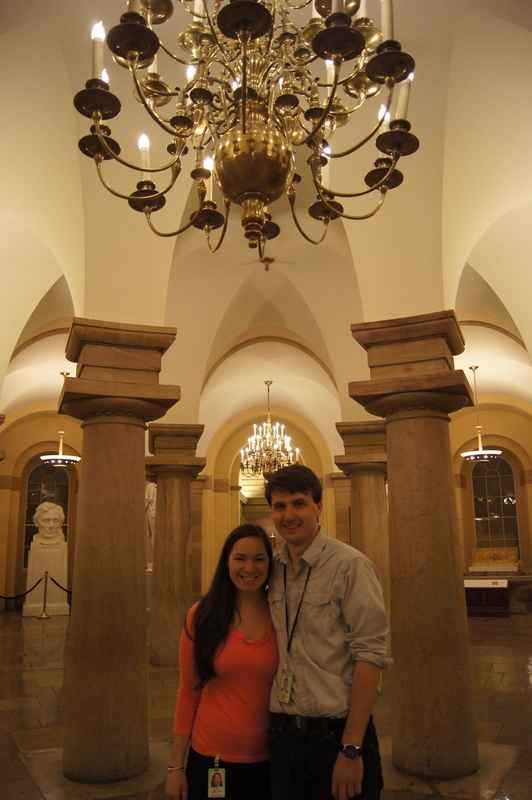 I was recently trained on how to give a tour of the Capitol. The spring is the height of tour season because every middle school comes to Washington D.C. for a trip. Those tours visit the old Senate chamber, the old Supreme Court, the Rotunda, the Crypt, and the two statues from New York hidden throughout the Capitol. I am really excited to get out of the office and started with tours.